Quick, easy and delicious, these Easy Peasy Roast Potatoes are perfect for your Sunday lunch…in fact they are so quick and simple to make, you could even have them as a midweek treat! I have to admit to being utterly obsessed with perfecting roast potatoes – for me they need to crisp on the outside and fluffy on the inside and deliciously flavoured with herbs, red onions and garlic. But at the same time I certainly don’t want my roast potatoes to be complicated or stressful to make. These Easy Peasy Roast Potatoes take just 10 minutes of hands on time, and the oven does all the hard work…so you don’t have to! 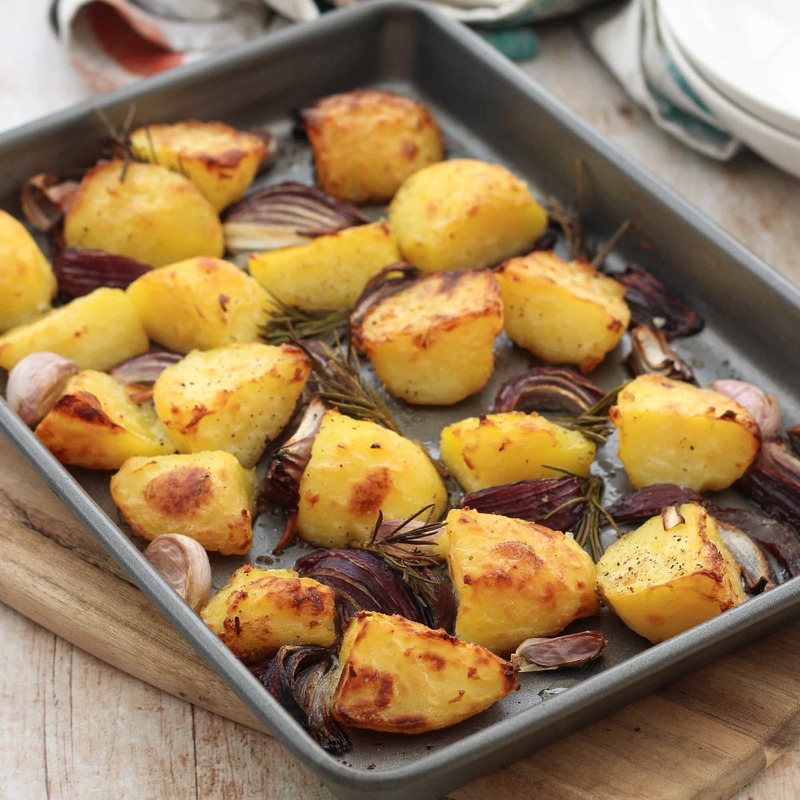 Personally, I think adding in red onions, garlic and rosemary really adds to the deliciousness of these Easy Peasy Roast Potatoes, but they are not essential, so leave them out if that’s all too much faff for you! These Easy Peasy Roast Potatoes would go brilliantly with my Classic Roast Chicken with Homemade Chicken Gravy. Alternatively they are fab with Roast Turkey for Christmas day or a classic Roast Leg of Lamb at Easter. Serve with my Honey Mustard Roast Root Vegetables for a delicious and stress-free meal! Fancy taking your roasties to the next level? Why not try my extra crunchy Polenta Roast Potatoes?! Prefer new potatoes? Then you have to try my Roasted New Potatoes with Garlic and Rosemary! Quick, easy and delicious, these Easy Peasy Roast Potatoes are perfect for your Sunday lunch...in fact they are so quick and simple to make you could even have them as a midweek treat! Put the potatoes into boiling water and cook for 12 minutes on a medium heat - start timing from the moment you put the potatoes into the water. Drain the potatoes and put them back in the saucepan. Put the lid on and shake the pan to rough up the edges, then tumble the potatoes into the baking tray, taking care not to splash yourself with hot fat, and turn the potatoes in the oil to coat them. The potatoes need to cook for about 1 hour in total. When you get the potatoes out at the 30 minute mark, add in the onions, garlic and rosemary before basting. If you are in a hurry, chop your potatoes up a bit smaller – say 30g / 1oz pieces – and they will cook in the oven in 45 minutes. If you do this, add in the onions, garlic and rosemary after 15 minutes. I am sharing this recipe with Brilliant Blog Posts, Cook Blog Share, Free From Fridays and Recipe of the Week. I’m so happy to know that I’m not the only roast-potatoes-obsessed person! And I say definitely yes to the red onion, rosemary and garlic. Such a delicious combination! One of my favourite things ever are roast potatoes and your version looks so crispy and delicious! I absolutely love roast potatoes and yours look absolutely delicious. In fact, I sometimes make a roast JUST for the roast potatoes 🙂 Thanks for joining in with #FreeFromFridays. Just how I make them. Yummy 🙂 I also like to fluff them up a bit as well.